Can the newer Audi A8 steal the S-Class’s crown? If you’re the kind of high-flying executive lucky enough to be in the market to buy a luxurious saloon to be chauffeured around in, you’re going to want the very best. The Mercedes-Benz S-Class has been sitting pretty at the top of the luxury car class year after year (it was our Best Luxury Car in the Parkers 2018 New Car Awards), seemingly unwilling to be nudged off the top spot by anything else. Of course, you could go super-high-end and bag yourself a Rolls-Royce or a Bentley, but if you’ve got less than £100,000 (the horror) to spend, the S-Class will be the kind of thing you’ll be looking at. The Audi A8 has long sat in the Benz’s three-pointed shadow, but this latest version aims to knock it off its perch with a veritable feast of advanced technology shoved into every possible corner. Is it good enough to see off the Merc? What is the best luxury saloon? Watch the video at the top of the page to find out which luxury saloon is best, and scroll down for details of the two cars under the microscope. There are a few more extras fitted, too, but these don’t have quite as significant an impact on the overall cost of the car as the ones listed above. Under the bonnet is a six-cylinder 3.0-litre turbodiesel producing 286hp and 600Nm of torque, meaning the S-Class is good for a 0-62mph dash in 6.0 seconds. It’s frugal, too, offering 52.3mpg fuel economy. At least on paper. The Audi tested here is the A8 L 50 TDI, which costs £72,210 before any optional extras are added. Getting carried away with options box-ticking could see you spending a small fortune on top of this, though – our test car comes in at a whopping £108,630. You get the picture… and this is just a small proportion of the total number of options fitted to this car, let alone what’s available on the whole options list. Performance is provided by a 3.0-litre V6 TDI diesel (don’t be fooled by the 50 badge), also producing 286hp and 600Nm of torque. Audi claims the A8 completes the 0-62mph sprint in 5.9 seconds (you can thank Quattro all-wheel drive for that), and will return between 48.7 and 50.4mpg, depending on the size of the alloy wheels fitted. The Audi also uses a 48-volt mild hybrid system, which works to help boost efficiency and smoothness of the power delivery, sending energy recovered in some driving situations back into the battery, and also makes the stop-start system much less intrusive and abrupt in traffic. There's also a coasting function at speed to boost economy, which you will notice when the car fires back to life. The A8 absolutely trounces the Mercedes in terms of equipment and technology available, both in terms of standard kit and the extensive options list. When it comes to performance and the way the cars drive, they’re both excellent luxury motors. 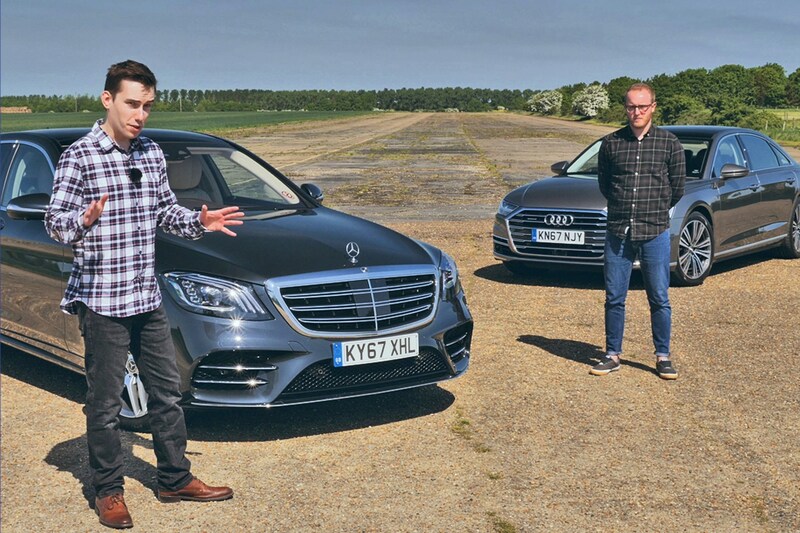 For the definitive verdict, watch the video at the top of the page to see whether the S-Class staves off the A8 newcomer.